My grandmother, the grease monkey? I’ve been struggling with what to write for International Women’s Day. The theme is “Connecting Girls, Inspiring Futures,” which is just so lofty. I don’t really know what we can do to connect girls even across the city, let alone across the world. Then I realized, what I do know about is connecting across time. What a girl wants when she’s 6 is different from what she wants when she’s 26, and it’s different from what lots of other 6-year-old girls want. As an adult, all I see in Flashdance is the stripping and the sexual harassment. When I was a teenager, all I saw was the dancing, and the awesomeness of being a female welder. I knew I’d never be a dancer, but I did think welding was within my reach. However imperfect, and sometimes even reprehensible, that movie and others like it are, I read in them the possibilities of a life very different from the ones I saw around me. 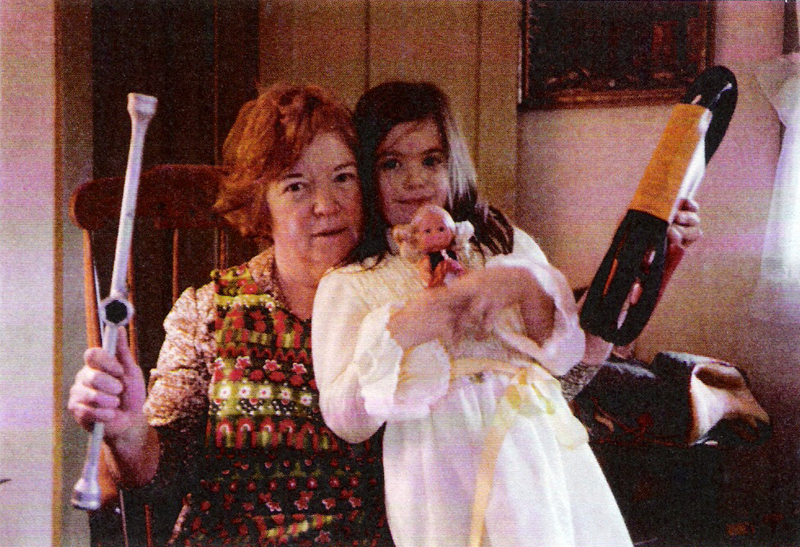 This picture shows me and my maternal grandmother posing with our Christmas presents (I think). I got a little blonde cheerleader doll. My grandmother, on the other hand, got a car repair kit. Depending on where you are in your own life, one of those presents might seem obviously better than the other, but we each got exactly what we needed. The lesson: You don’t have to understand someone else to respect their desires, different though they might be from your own. This entry was posted in Miscellany and tagged fair is fair, feminism, Flashdance, International Women's Day, life lessons. Bookmark the permalink. What an awesome picture and story!